This is a custom made to order sofa. Please allow a 10-12 weeks lead-time; deposit required, all sales final. This is a made to order item. Please allow 8 - 10 weeks production prior to shipment. This is a made to order item in the USA. Lead time is based on fabric availability. Standard lead time for in stock fabric is 8-10 weeks. Expedited production of 4 weeks is available for a 25% up-charge. Please allow up to 2 additional weeks transit time for your item to arrive. 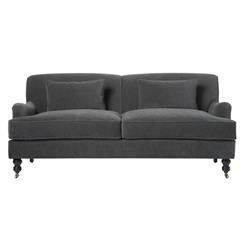 We love the traditional attitude, handcrafted upholstery and finial legs of this classic sofa. Shown in dark grey velvet, the timeless good looks and inviting proportions make this an easy piece for traditional and transitional fans alike. Customers own material available: 18 yards required; (2) x 12 x 21 inch feather cloud lumbar pillow included. Fabric is not treated with Scotchguard™. For customers with children or pets, it is recommended.